Coil 1 - Coil 4 loose 12.8 volts in a matter of seconds on Red w/White Stripe wireThe lower of the 3 solenoids on the back of the engine clicks at "key on" and clicks again in a few seconds This seems to associated to when the ignition is turned on and it clicks, there is fuel pressure but in a few seconds it clicks again and fuel pressure is lostThe lower of the solenoids on the back of the engine clicks at "key on" and clicks again in a few seconds. 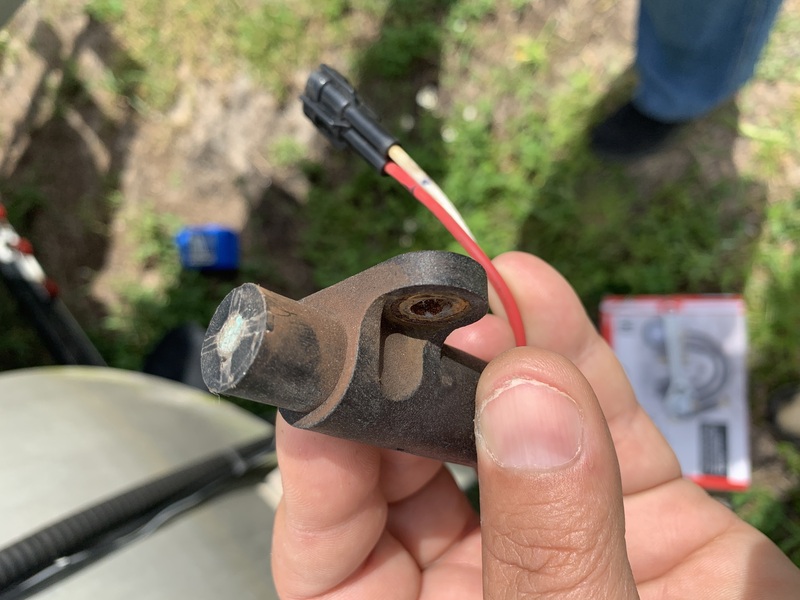 This seems to be associate to when the key is move from off to start the Red and White have 12.8v of power but after the 3rd solenoid clicks during the cranking of the engine, the voltage is lost at the coil on Red w/White Stripe. Does the engine crank over at all and just not start? Or does it not even crank, i.e. spin with the starter? Thanks. Did you check for spark when it is cranking over? That is by design. The ECU powers up the system for a few seconds and does a system check on the coils and injectors. Then it powers off until a crank signal is received. Can you do a resistance test on the CPS? It needs to be 330 Ohms. unsure where to check next. Do you recall what the fuel pressure is? i dont know what a CPS is, where its located . 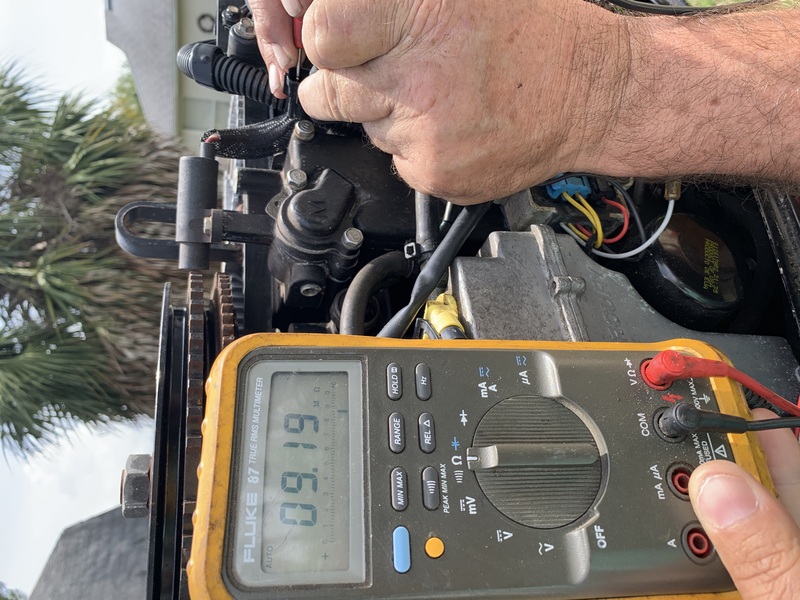 As for fuel pressure, I do not have a guage, i disconnected it from when looking at the rear right side at the quick disconnect line going to the injectors, it plugs into a round device. When disconnected it shot fuel against the back of the boat in a heavy stream about 2 feet but that stops in about 5 seconds when I hear that solenoid click the 2nd time. The CPS is the crank position sensor. The one you tested at 2.8V. How long has the engine been sitting? The engine has been sitting a few years out of the water on a trailer.i cleaned the vst, replaced fuel filters, wires and plugs and oil/filter.. I was told it would not start when purchased. Ok. Can you test the CPS? A fuel pressure gauge is really needed to test that pressure. One can be normally be rented from a chain auto parts store. can you explain how I test the CPS? Unplug it. Then set your meter to read resistance. Test between the 2 wires in the plug going to it. It needs to read 330 Ohms. Am i checking the CPS side or the wiring harness side of the engine? Ok. time for me to eat dinner. I'll be ready when you are. Sorry earlier on the CPS, aka Crank Position Sensor. Now if it’s a 87 grand national/t-type or a 4.3 Chevy I would of picked up this. I’m more of a car guy but have a Scanner for Mercs etc... typically I find nothing with the scanner. The scanner is good when there is an alarm or the engine will run. Not too much help when they dont start. I’m waiting on the wife and will check the engines CPS. I did do a injector test with the scanner and all passed, and I heard them come on for the test. I know the computer is ok in a sense because it will this a alarm when a coil in unplugged. Ok. the CPS test is not a cranking test. It is static, only on the unplugged sensor. is the kill switch in the on? OK. Mercury has changed styles a few times. The newer ones will crank but the spark is killed. that is going to the sensor correct? Touch the meter leads together and make sure that they will read 0. That is the correct test, it should read 330 Ohms. If it does not, the engine will not have spark. Often I need to use a paperclip to get a good reading oin it. The pins are rather small. If it is good. Then a fuel pressure test is really needed. Yes. I always test at the VST. It should be 30+ with the key on. OkWill reply back tomorrow morning. Thank you! Oh, does that engine have a electric fuel pump? Or is it external? There are 2 pumps. One on the back of the valve cover and an electric one inside the VST. Also make sure that you have good new fuel. Outboards do not like old fuel. Used another meter. Used red and black to the female pins and have nothing. Am I test the right sensor? Sounds good. I am back at the computer now. Had to do some family stuff. Its Running!!!! thanks for all your help.. question for ya - will this model engine show engine hours on the computer? now that its running im going to hook up my scanner to get some live data.. Thanks again for all your support. Glad to hear that it is running again. Yes the ECU will show total hrs on a scanner. Depending on the scanner it will also show fault history. I would clear that so if the horn goes off again, you will know why. 1989 50 HP Force with no spark. What can be the issue?